SLC Comic Con, A Sensational Sensory Overload!! SLC Comic Con or Salt Lake City Comic Con. What a rush for this old collector. I have been writing for this, my website now, since 2004. And I have never been to a convention; comic book, sci fi, Star Trek or otherwise. For one, it just never seemed to interest me and for another, there has never been a convention close by. Well, at any rate Salt Lake City, Utah decided to form a comic book convention of their own located at what is called the Salt Palace Convention center. It is 45 minutes or less from where I live. So, guess what? I purchased a ticket and drove down for a couple of days to see what it was all about. Phenomenal! If this is any indication of what SLC will do in future cons, then who needs San Diego. For my first comic con adventure, it was a tremendous play on the senses, as a matter of fact, sensory overload. It was really worth the trip down. The event is being touted as a first time success. Many new cons start out with a few thousand attendees. 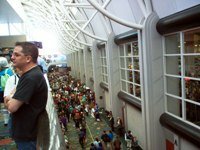 The SLC Comic Con is boasting ticket sales and attendees of the order of 30 to 50 thousand. Not bad for the first time out of the gate. And actually to tell the true, it was a tad overwhelming for this old dude (me)! I purchased a 3 day ticket, but was only able to attend the first two days. All the walking and interacting with the massive crowds was just a little much for me to physically handle (I have symptoms of Diabetes II possibly). So after much thought and decision, I decided not to drive down for the third and most attended day of the SLC Comic Con. Too bad! This was also the day Stan Lee and William Shatner attended. And for $50 to $75 I could have purchased a personal photo op with both. Oh well, I have gone this long without ever obtaining celebrity photos. Another year or two won’t hurt. Lou Ferrigno was in attendance also. I did get to see him. As luck would have it, while locating a water fountain and rest room to be used throughout the day, my path took me past Lou’s booth. My, what a man mountain or Hulk! Somewhat different than what he has appeared on the TV screen though. As I cruised celebrity row from outside the paying roped off areas, I saw a few whom I recognized. Dwight Schultz (Reg Barclay from Star Trek, The Next Generation and the Original A-Team), Richard Hatch (Original Battlestar Galactica), Henry Winkler and even Q (John De Lancie). And I am now happy in my old age that even the stars age. They were sure looking a tad older than in their earlier TV years. I didn’t purchase a photo op or autograph (didn’t budget for them), but I got to see them. But at any rate, my major goal was to get the lay of the land, see what I could see and start planning for next year. My goal was reached with the first two days and well worth the time and effort. From what I could tell, there are 4 main efforts for an event of this nature. There are first, the vendors who are there to sell their wares to the convention goers. Then there is celebrity row who are there to sell their wares (photo ops and autographs) to the convention goers. And upstairs are the workshops and panel groups, many meetings going on all three days. More on the one I went to in a minute. And last but by no means least, were the Cosplayers, many, many individuals dressed up in costumes. The vendors, many and mighty, had about anything for sale that a geek with money would want. And the costume enhanced individuals who wandered through vendorville were always available for pictures (for free). There was also a Cosplay Competition that I happened to miss. These competitions have gotten very popular and quite stiff over the last few years at all the Comic Book Conventions throughout the country. The first night out I managed to grab a few minutes with Ben Hansen from SyFy’s “Fact or Faked – The Paranormal Files”. A real nice guy to talk to. And as luck would have it, not only is he the lead investigator on this show, he is also from Utah. Appears they are revamping the protocol of the show in hopes of being picked up for another season with the SyFy channel. I wished him well and moved on. In the last several weeks I have also become privy to another Area 51 type ranch here in Utah called the Skinwalker Ranch owned by Robert Bigalow, who coincidently is designing inflatable habitats for low earth orbit. Anyway Skinwalker is supposedly a hangout for space aliens, Bigfoot and the like. So I managed a conversation with Ryan Burns, who runs Strawberry River Services. He sets up package deals for hotel and outdoor recreation services. And if you ask politely, LOL, he will take you out looking for Bigfoot or what have you. If you are interested in a weekend outing (space aliens may be included, ha ha) then check out his site at strawberryriverservices.com. As a side note, I am quite a skeptic when it comes to paranormal, space alien, Bigfoot types of stories. Not that I wouldn’t like to see something of this nature, but I am one of those, let me see it first before I believe it, types of individuals. Before I left for the evening I talked to a gentleman in my age bracket (lots of younger people at the con) who was selling comics. Said his wife gave him his marching orders to get rid of all his comics. So he rented a booth at the Con and hauled his comics down. There were a lot of comics more geared to my interest, being an aging baby boomer. I would have loved to sit down in a corner with his boxes and sift to my heart’s content. But no corner to do that in and I was getting pretty bushed and ready to head home. The next morning I was so stiff and sore I could hardly roll out of bed. But after sufficient coffee, computer work, shower and lunch, I headed back down to the SLC Comic Con. The line getting in was not much at all, but boy was the place packed. And it got worse later on. So I did some wondering around in the vendor area and up and down once on celebrity row. Then I headed upstairs to find a good panel to view. After much deliberation I settled on “From Action Comic #1 to Man of Steel”. This was a tribute to the 75 years of Superman history and individual and national interpretation of the man of steel. So I went to sit in the line, seen in image here. This panel, of all ages, covered Superman of all ages. George Reeves, “Adventures of Superman”, Christopher Reeve, “Superman the Movie”, Dean Cain, “Lois and Clark, the New Adventures of Superman”, Tom Welling, “Smallville”, Brandon Routh, “Superman Returns” and Henry Cavill, “Man of Steel” were all discussed. And each panel member had their own definitive Superman, depending on which one came into their lives as a child. Of course, me being a Baby Boomer, I was partial to George Reeves, would was the first to bring country wide, if not world wide recognition of Superman. Mr. Reeves made a house hold word of “Superman” which up to that time was only known by the geeks of the day, shall we say. Needless to say, it was a pretty lively discussion with the role of Superman being presented as that which was not unlike the coming of Christ. That could be said with a grain of salt, but the parallels were pretty amazing. Each to their own on the messiah interpretation! After the panel discussed their defining of their favorite Superman actor, the crowd was given a few questions of which weren’t real memorable. I can’t remember any of them. There were only about 3. The panel was running out of time and wanted to bring on a real surprise. They brought in Dean Cain to join the panel. 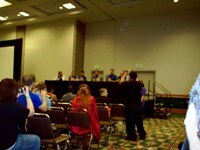 He is in the middle of the panel in the image to the left. I know I am a lousy picture taker!! This was a very welcome surprise to see Mr. Cain in the flesh. And it was mentioned it had been twenty years since the start of Lois and Clark. Dean Cain was looking very well for an additional twenty years and could have pulled of the part of Superman again. After the mutual admiration society of the panel ended, Mr. Cain talked about some of his new projects he was working on. One was hosting a Bigfoot series offering $10 million dollars for substantial proof of Bigfoot. This could be interesting and airs in January of 2014. Well, although rather lengthy, those were the highlights of my first Comic Book Convention. Check out SLC Comic Con for more information. And it appears there were 70,000 to 80,000 participants at the SLC Comic Con on the 3rd day. So although I missed Stan Lee and Captain Kirk, of which I probably wouldn’t have gotten in anyway, I also missed the massive crowds. I made the right decision to not go down on day three. A better camera and learn how to use it. I am sure you would agree. Well, here is hoping you will one day enjoy your first convention or have more of what you have experienced in the past.